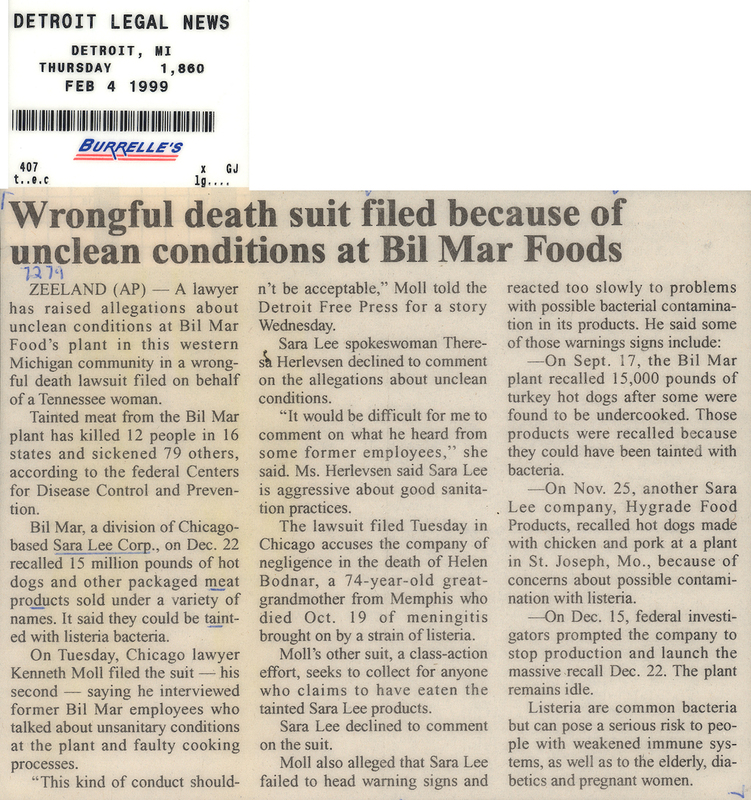 Zeeland (AP) A lawyer has raised allegations about unclean conditions at Bil Mar Food’s plant in this western Michigan community in a wrongful death lawsuit filed on behalf of a Tennessee woman. This kind of conduct shouldn’t be acceptable,Moll told the Detroit Free Press for a story Wednesday. Sara Lee spokeswoman Theresa Herlevsen declined to comment on the allegations about unclean conditions. It would be difficult for me to comment on what he heard from some former employees, she said. Ms. Herlevsen said Sara Lee is aggressive about good sanitation practices. The lawsuit filed Tuesday in Chicago accuses the company of negligence in the death of Helen Bodnar, a 74-year-old great-grandmother from Memphis who died Oct. 19 of meningitis brought on by a strain of listeria. Moll’s other suit, a class-action effort, seeks to collect for anyone who claims to have eaten the tainted Sara Lee products. Sara Lee declined to comment on the suit. ---On Sept. 17, the Bil Mar plant recalled 15,000 pounds of turkey hot dogs after some were found to be undercooked. Those products were recalled because they could have been tainted with bacteria. ---On Nov. 25, another Sara Lee company, Hygrade Food Products, recalled hot dogs made with chicken and pork at a plant in St. Joseph, Mo., because of concerns about possible contamination with listeria. ---On Dec. 15, federal investigators prompted the company to stop production and launch the massive recall Dec. 22. The plant remains idle.